Perth Mint proudly offers a distinctive design represented by one of 12 animals of the ancient Chinese lunar calendar. For 2019 we celebrate the twelfth animal in the 12-year cycle of the Chinese zodiac, the Year of the Pig. 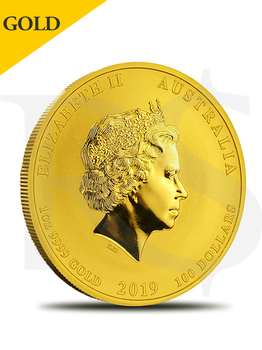 This delightful 2019 Gold 1 oz Australia Perth Lunar Pig coin will conclude the Lunar Series II. This will most certainly be a treasured and valuable addition as it completes your collection! The birth years for people ruled by the Chinese Lunar Year of the Pig include 1923, 1935, 1947, 1959, 1971, 1983, 1995, 2007 and 2019. Those born under the influence of this sign are said to be honest, loyal, sincere, and generous. This 2019 Gold 1 oz Australia Perth Lunar Pig is a must-have to complete your Perth Lunar Series II set. With limited mintage of 30,000 you should not delay! 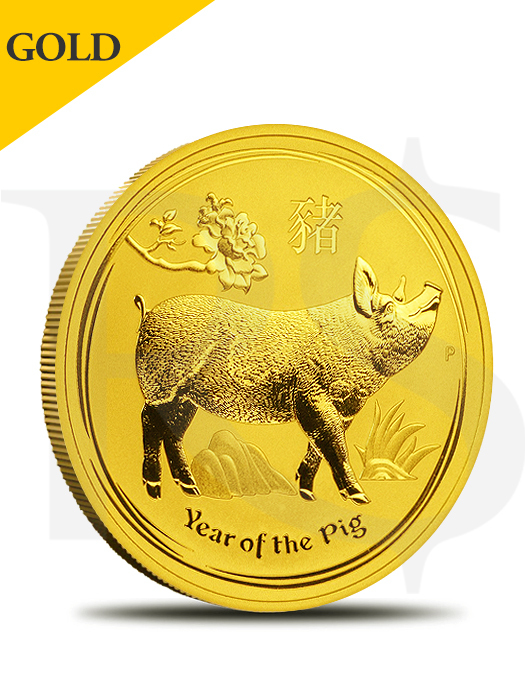 2019 Gold 1 oz Australia Perth Lunar Pig BU. Contains 1 oz of .9999 fine Gold. Limited mintage of 30,000 worldwide distribution! The all-important final edition, completing the Perth Mint Lunar Series II. Obverse: Displays the Ian Rank-Broadley likeness of Her Majesty Queen Elizabeth II, the coin's weight and purity, and the (AU) face value. Reverse: Features a truly delightful scene of a large domesticated pig, snout raised high, stepping along a group of rocks and a nicely-stylized plant. Above head an attractive leafy branch hangs with a beautiful pelony flower. Also included are the Chinese character for "pig," the inscription "Year of the Pig" and The Perth Mint's traditional "P" mintmark.